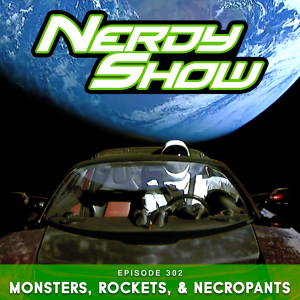 From far away lands, near Earth orbit, and the gutters of the Internet, we’re sourcing the finest semi-organic nuanced discussions on all things nerdy. Cap, boR, Brandon and Jess are hunting monsters, breeding monsters, and reminiscing about ranching monsters with the new games Monster Hunter World and Monster Breeder. We also dial up an old pal for his debut appearance on Nerdy Show: long time listener, first time caller, Ice Abyzz – the Icelandic fan who’s now a cast member of the acclaimed audio drama, The White Vault. We talk to Ice about his upcoming trip to NYC to do a live recording of the show, opening for The NoSleep Podcast, and also get the skinny on the hottest Icelandic fashion trend: necropants. Cap and Brandon took a co-op trip to parts unknown in Mario Odyssey, and meanwhile Jess was living it up on yet another Japanese vacation. Plus we softly and delicately bite into the Lady Doritos controversy and then get explosive about SpaceX’s grand geek gesture with the Falcon Heavy test flight.